Hi Everyone! I'm sharing a card with you today that could be used for "get well", "thinking of you" or "encouragement". Most of the products used on this card can be found at the Classy Cards N Such Online Store. I started with a gray card base that measures 6 x 5.5. To the base I added one of my favorite patterns from the Glitz Designs French Kiss Collection. French Kiss is an elegant vintage collection of designer paper with shades of brown and gray. Next using the gray cardstock and Spellbinders Decorative Labels Eight, I die-cut a label to stamp the Scripture on. I stamped the Scripture with white craft ink and then sprinkled white detail embossing powder over it and heat embossed. I sponged distress paint in silver on the edges of the label. I knew I wanted flowers in my design so I pulled out Judy's Blooms Floral Dies by Cheery Lynn Designs. 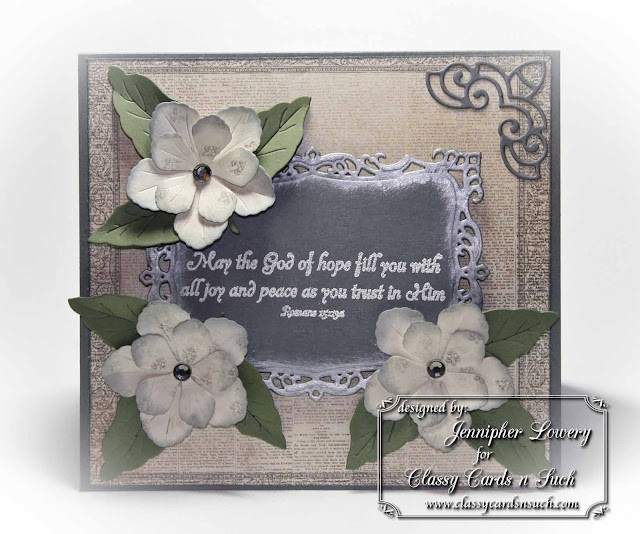 The blooms were cut out using the fleur de lis designer paper from French Kiss Collection. The leaves were cut out using some green cardstock from my stash. For the flower centers I used Want 2 Scrap Silver Rhinestones. For finishing touches I added a Lace Corner Deco A by Cheery Lynn Designs. If you are interested in any of the products that I used today you can find the links to them in this blog post @ Classy Cards Blog. Amazing card! It's beautiful. I love the lace deco corner, and the flowers. Those really stand out as exceptional. Lovely verse too! So pretty! Love the beautiful flowers and sentiment! What a stunning card. I love the colors and flowers. Absolutely beautiful! The flowers are so pretty! This is so pretty! That grey cardstock is stunning. Love all the elements of the card. And the colours are so soothing. Perfect for a get well card/encouragement card. Spectacular card, Jen - gorgeous colors combined with embellies. beautifully done. i agree with the others... the colors are super gorgeous! !